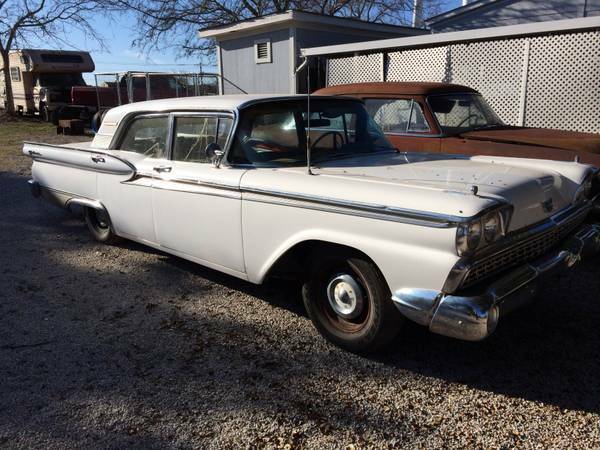 In 1957, Ford’s Fairlane sprouted wings for its second generation. By 1959, the car had evolved to share many styling details with its Thunderbird sibling, with a similar grill and front end, and low fins and rocket tail lights at the back (the only styling detail it shares with a BMW 2002!). Nonetheless, this car could be considered restrained when parked next to its Chevrolet competitor, and it sold in comparable numbers. 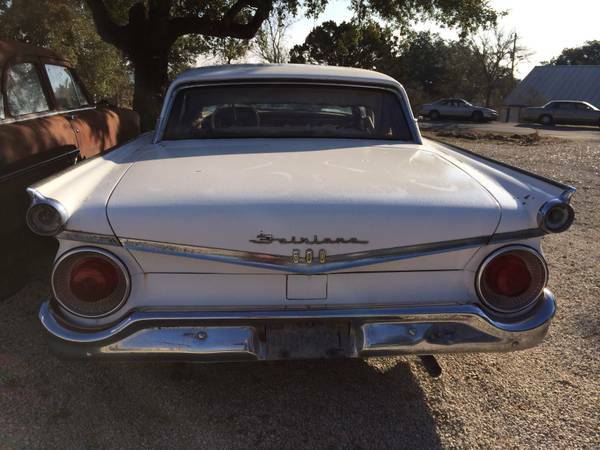 You can find this 1959 Ford Fairlane 500 for sale for $4000 in Spring Branch, TX. This particular car is powered by a 352 V8 via an automatic transmission, sourced from a 1962 car, so you should have around 300hp handy, discounted a little due to the optimistic power calculations of the time. It’s been listed for a while now, so there might be some room for bargaining. That said, for a car at this price, the exterior looks pretty decent – paint with quite a bit of life left in it, and all the trim seems to be present. 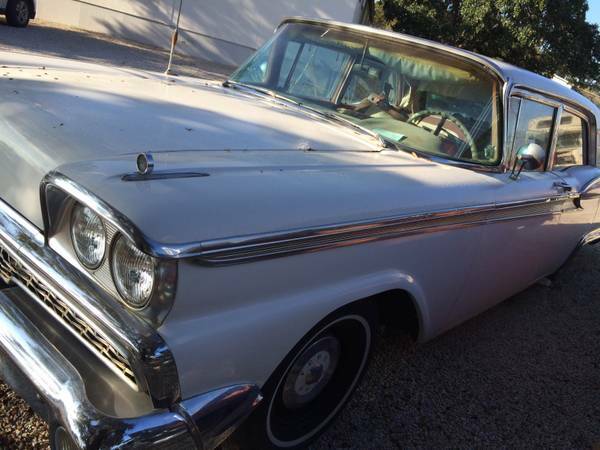 It’s possible this is a Galaxie car, judging by the Thunderbird-like roofline, but the seller leaves that to your imagination. The picture does a good job of capturing the car’s character – anthropomorphizing a little, it would be that guy who’s big, loud, in your face, and a little too close for comfort. Basic hubcaps on these older cars are cool – everyone seems to have upgraded to full wheel covers. To the untrained eye, these look as though they might be from an earlier shoebox Ford, but they often carried over from model year to model year since, hello, cheap! Perhaps these suggest the car was originally a base six-cylinder model? The interior looks pretty decent, if somewhat faded and with some split seams. Since this is almost a couch, perhaps you could find a cool couch cover to pull over, or of course the more common Mexican/Indian blanket. Interestingly, there seems to be an AM radio on the dash. 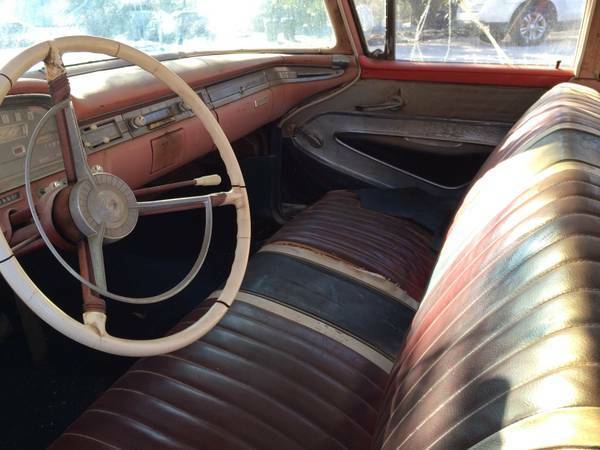 Perhaps a little polishing of the interior features will give this car more of a well-loved, well-used look. While not as informative as a rear three-quarter shot, the design cues are oh-so-1950s that it couldn’t be left out. That said, it does look like you’ll be dealing with a sagging headliner and shredded rear bench top. All in all, though, it’s a lot of metal for your dollar. This entry was posted on April 4, 2014 at 10:54 am and is filed under Feature. You can follow any responses to this entry through the RSS 2.0 feed. You can leave a response, or trackback from your own site.